2019 MCVG Bayou Boogaloo Bicycle Pub Crawl will take place Saturday morning, May 18. 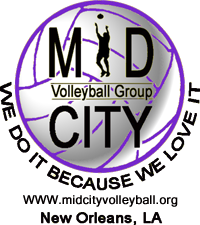 The Mid-City Volleyball Group (MCVG) is a collection of people from across the city who are passionate about playing and promoting outdoor volleyball. We regularly set up portable courts along the Lafitte Greenway or along Bayou St John across from the Mid-City post office for clinics, tournaments and pick-up games. We are equal-opportunity fun-seekers who wish to share our love of the game, so we invite players of all skill levels to join us. Our ultimate goal is to build and operate a modest sand volleyball venue in Mid-City that will offer beginning and advanced level clinics, tournaments and league play. These days we start Saturday volleyball at 9:30am. Monday evening v-ball starts at 5:00pm. As of Feb 2019, we are located on Bayou St John across from the Mid-City post office on both days. Inclement Weather? Any cancellation notice will be posted on this page no later that 9:00am Saturday. Be advised that we play in the rain, we play in the cold, we play in the heat. We rarely cancel. Please see www.midcityyouthvolleyball.org for more information about the 2015 youth clinics. is a non profit organization.